Description: "Threshing floor behind the fruit gardens and planted woods in Ohrloff. The roofs of the large barns are visible." A copy of this filed under "Russia-Warkentin album" says this was in Blumenort. Source: Henry A. Epp, Niagara on the Lake, Ontario? 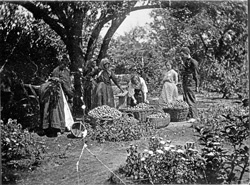 Description: Orchard in Neu-Halbstadt; hand-written on the back is the number "6308"
Note: MLA does not have original print. Digitized from copy print.